There are many reasons visitors to Myrtle Beach, South Carolina, love to stay at Bay View on the Boardwalk, but the biggest factor (or is it the top three?) is location, location, location. Bordered by Myrtle Beach's most popular downtown hot spots – the beach, Ocean Boulevard and the Myrtle Beach Boardwalk – Bay View on the Boardwalk gives guests a chance to experience the best of Myrtle Beach within walking distance of the resort property. But for our more adventurous guests looking to explore more of the Grand Strand, Bay View on the Boardwalk also goes the extra mile to make sure you and your crew can enjoy some affordable family entertainment with our Sun & Fun Rewards program. Upon checking in, each party receives a packet filled with free passes and discount vouchers to some of the top attractions on the Strand, as well as some more perks and freebies just for being our guests. * Broadway Grand Prix: Start your engines and let the good times roll at this go-kart track and family fun park near Broadway at the Beach. Boasting seven racetracks and other speed-themed thrill rides, Broadway Grand Prix also offers patrons some fun in the slow lane on its two 18-hole putt-putt golf courses and in its massive arcade. Broadway Grand Prix has something for the whole family, and Bay View guests can purchase all-day adult passes for only $29.95. 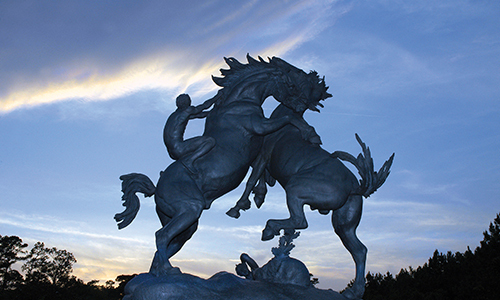 * Brookgreen Gardens: Located just 20 miles south of Bay View on the Boardwalk is one of the prettiest spots on the Grand Strand and in the entire country. This 9,100-acre former rice plantation now serves as the largest and oldest botanical sculpture gardens on the East Coast, providing spectacular works of art and gorgeous tracts of nature in a scenic Lowcountry setting. Visit the Native Wildlife Zoo, the Gullah Cultural Arts Center or the Butterfly House for an added bonus. Bay View on the Boardwalk guests receive one free adult admission via the Sun & Fun Rewards program. * Ripley's Aquarium: Make the short drive to Broadway at the Beach and see creatures from the depths of the ocean at Ripley's Aquarium. Featuring enormous tanks filled with all kinds of aquatic life – sharks, stingrays and horseshoe crabs, just to name a few. The interactive exhibits and live shows are both entertaining and educational for the whole family. Ripley's Aquarium also offers mermaid shows and other displays that are definitely worth the price of admission, especially when you get one adult entry free through your Sun & Fun Rewards package. * WonderWorks: What do you get when you cross a mad science lab with a Category 5 hurricane? WonderWorks – a Broadway at the Beach attraction that highlights the wild and weird world of science in a fun, interactive environment. The upside-down building has three floors to explore, including a ropes course and a laser-tag room on the top (or is it the bottom?) floor. Use your one free adult admission to make it more affordable for the whole family. Between the beach, pools and downtown attractions near Bay View on the Boardwalk, as well as all the free, fun entertainment provided by your Sun & Fun Rewards package, an autumn retreat to Myrtle Beach is the perfect avenue for a fun and affordable family getaway. It’s time took book your plans today.